There are always sides to a discussion involving tradition and emotion. So many arguments about the use of a single front chainring versus a double or triple. In this case, tradition has generally stood with a single front chainring for single speed bikes (think kids bikes), city type bikes, and the “grandma” bikes with multi-speed hubs. Of course that’s an exaggeration, but as they become more common on high-end bikes the discussions about a single up front become more involved. Let’s look at it. People have been riding and racing single front chainrings for … well, forever. The first bikes had, of course, no chainrings, but later, as drive systems were created, they included a single front chainring. As technology evolved, bicycles first started having multiple gear ratios in the rear with multi-speed hubs, then external gears. 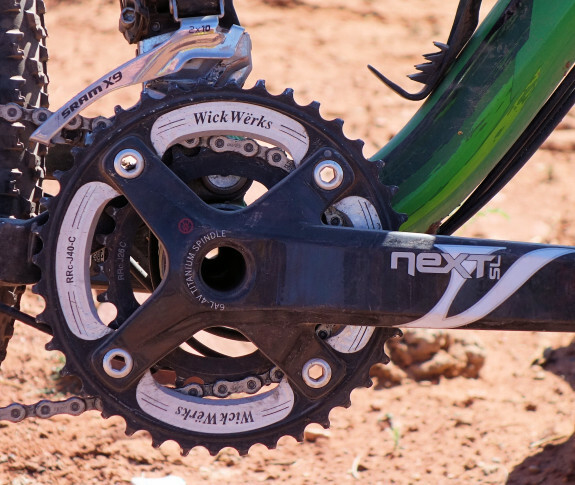 The desire for range has continued to move the industry from single front chainrings to doubles to triples with more and more ratios in the rear. Now, we’re starting to see a change in that trend — from CVT’s, Continuously Variable Transmission (hubs), to dropping front chainrings. First it was the change from standard triples with mountain bikes, to what we typically call 2x10s. At about the same time, the industry moved to 11-speed with road bikes (oddly enough expanding ratio range and minimizing steps) while production mountain bikes started to appear more with single front chainrings. Single front rings are obviously not new, even in professional competition, but it has not been a mainstream standard in performance bikes. Then, SRAM introduced the XX1, which addressed a big concern with single front rings by combining a wide ratio 11-Speed cassette. As they have promoted it, others have hopped on the bandwagon offering single front chainrings too. What is the “Best” Configuration? The answer to that question is different for each person, and often for each situation. Here are the factors (then you decide). Why a Single Front Chainring? 1. Lighter Weight – Loose the other chainring, but also the front derailleur, the shifter and the cable. 2. Less Complication – Without the FD, shifter, and cable, there is less to adjust, and less to go wrong. The main thing you give up is Gearing Range — which has some significant ramifications — discussed below. Simplicity has its virtues. It can be a liberating feeling, and for some people, range not a big deal. For some riding situations it’s not a big deal. Yet, for others, that seriously changes the fun factor and ruins the ride. 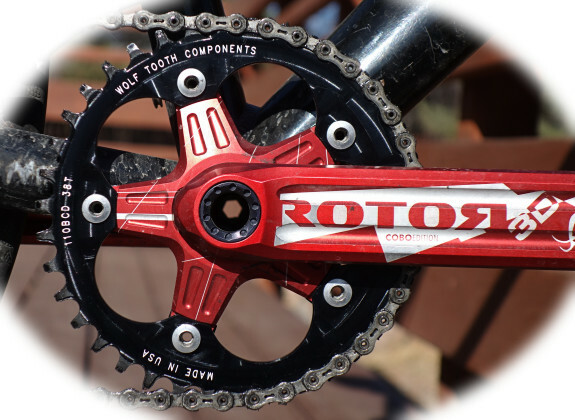 Why Double (or Triple) Chainrings? 1. The biggest advantage for multiple chainrings is range — Gearing Range — meaning more span from the lowest to the highest available gear. In practical terms, it means having lower gears that allow you to climb the longer steep sections, and having higher gears so you can pedal down the fast descents. 2. Efficiency is the second big advantage. Efficiency in 2 areas — First being able to stay in your physiological operating window, and Second, the ability to avoid inefficient situations like cross chaining that chew up your watts and spit them out as worn-out parts. 3. Confidence. Knowing that when you show up for a ride or a race you will have the needed ratio range. When racing for the first time on a select course or traveling to a destination ride, for example, you know you’ll have the gear availability for both climbs and descents, as well as physical and environmental conditions. Third, (for many situations) dealing with poor performing transitions from one chainring to the next — less than stellar shifting. 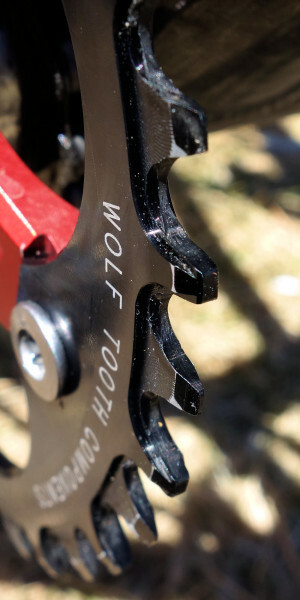 First Example: There are long arguments about numbers of teeth for chainrings in cyclocross. Tradition puts a 46/36 set on most CX bikes — which is most common size on course. A small change to 44T feels like a huge difference — especially on courses with steep sections. Why? It’s only 2 teeth for heavens sake! Less than 5% change in gear range. Second Example: How many arguments have you heard about 26″ wheels versus 29″ wheels for mountain bikes? Whole forums were opened in big name places like MTBR to discuss an 11% change in wheel size. — And now 27.5″ wheels (right in the middle)! Let’s frame the range discussion in the context of the human body — since bicycle gearing wouldn’t mean much if we didn’t pedal . . . The human body is an amazing machine. It can do big and small — and at the same time. Did you know you can sense particles smaller around than 1/4 of a human hair? Yea, really, some of the grit you get in your mouth can be less than 1/4 the diameter of a human hair, and you can feel it between your teeth. That’s smaller than some people can see! 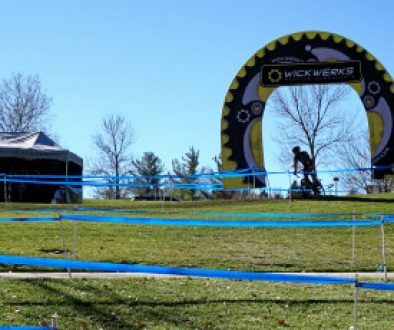 Chainrings Example: For 2013, WickWerks provided special chainrings to Katie Compton for her CX season. Strangely enough, they were smaller, not larger than tradition. While many are running a 46T big ring, Katie moved from a 44T to a 42/34T set for improved speed. What? Yes, even though Katie is an amazingly strong and capable racer, the smaller chainrings made more sense for being fast than the bigger ones. Smaller chainrings are not the ticket for everyone, but it illustrates that our bodies are unique, and if you’re willing to go beyond the emotional attachment of doing things the way others have, you might actually be faster. The re-phrased question above is really more telling because our studies show that people don’t generally trust their front shifting, so they don’t do it as often as would best benefit them and their ride. Looking further at facts, it has been shown that the human body naturally has a condition (cadence and body position) where it can produce the most power for the longest time. That window, is, of course, different for each person (fast-twitch, slow-twitch, etc.). And, though we can train the body to expand the natural window, the edges of the window are inherently less efficient. This window of power and efficiency is exactly what has driven the bicycle industry to more and more close ratio gears. Your body naturally wants to stay in that window, so as the road tips up or down slightly, or as the wind changes, the natural desire is to have that 5% or 10% change in ratio to match the conditions and keep cadence and power in that physiological efficiency window. Our research shows that many people interested in single front chainrings are actually just frustrated with poor front shifting. If their shifting was good, there would be no need to ditch the front derailleur. If that’s your case, you should try WickWerks chainrings because they shift faster and better than anything else out there. Unfortunately, you have to experience it to truly understand. Second Question: How much do you ride in the “cross-chaining” situation from the big ring to the biggest 2 cogs? Third Question: How often do you shift just one gear to stay in the “sweet” spot of the efficiency window? – If the answers to questions 2 & 3 are “Never” or “Almost Never”, then you’re a great candidate for single ring’n it. – If, on the other hand, your answers are “Frequently” or something like it, then you are probably going to ride better and faster with easy access to multiple front chainrings. Choosing the right gears will be addressed in a future feature, but in context of the broader question of how many chainrings to use, here are some ratio charts to consider. Total Ratio Availability: This first chart shows total range of several available mountain bike ratios. 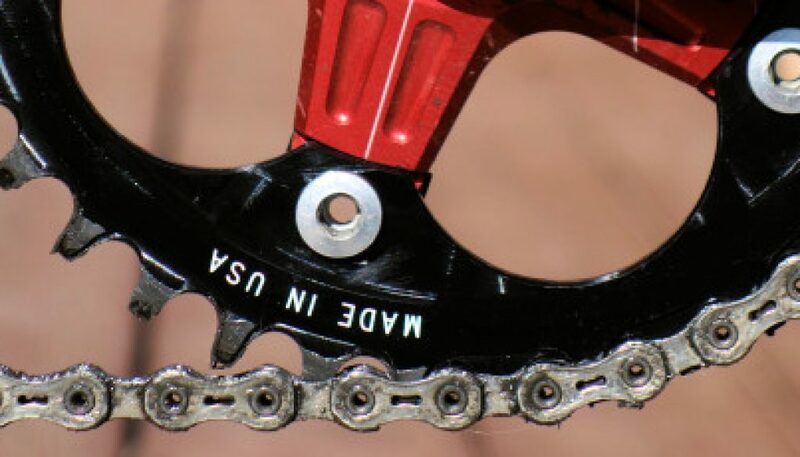 The single front chainring is indicated — the span shown is the available span provided by ONLY the cassette (11-36 Mountain bike cassette). 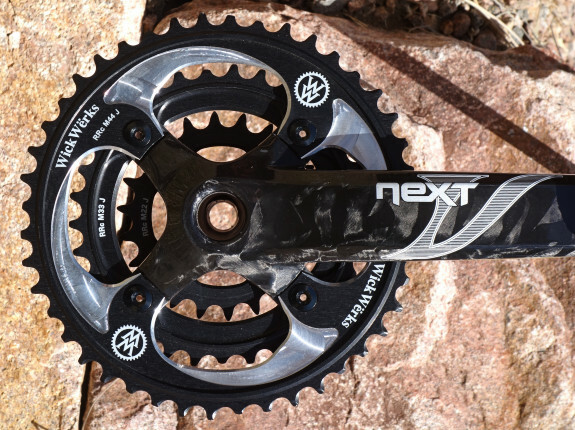 The XX1 single front ring shows a greater span because the XX1 cassette is 10-42. As a reference, the lower line shows the span of a typical CX cassette. Other bars on the chart represent total ratio span available for different chainring combinations. Note that bars have no reference to speed, or possibility. They simply show the ratio span from the lowest ratio to the highest. Chart 3 is similar to Chart 2 except that it puts the information in a distance context — distance traveled in on pedal stroke. 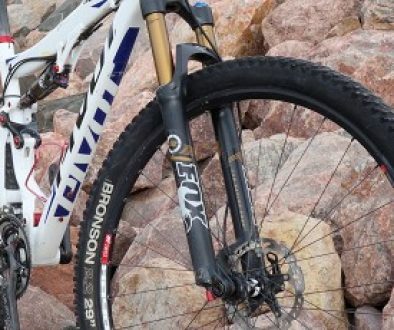 These numbers are based on a 29-er, but can be easily scaled to other wheel sizes. So how do we use this information? It is not easy to graph “feel” and that’s really what it’s all about. To make it meaningful, first we need to make it real. Think about your own experience riding in the biggest rear cog and how that feels with respect to riding in your smallest rear cog. That feeling is the difference between the two ends of each bar of the graph. Pause a minute and think about how that feels. Now that you have some context, go back to the discussion above about how sensitive the body is to small changes. When you look at any of the double or triple chainring combinations you see that those bars extend well beyond the single rings by many percent — much more than the 5% or 11% we already discussed as being significant to the human body. In the graphs it does not look like that much difference between single and double chainrings, but when you think about it, the difference between the single front chainring and the MTB triple in terms of span (Chart 1) is 200%. That’s like going from a 29-er to a 58″ wheel!! No doubt you’d notice that. Going back to the discussion of the body and its performance window, depending on the terrain you’re riding and the environmental situations (wind, race, etc. ), your personal ratio needed for a given situation will change. What we’ve found is most people are faster and enjoy riding more when they have proper ratios available for the terrain. Many riders embracing single front chainrings discover they don’t enjoy the ride as much, or find they are slower. Especially in mountainous racing situations, having to grunt up a climb is slower. Having to coast down a decent (because you can’t pedal that fast) is slower. The biggest problem with these kinds of discussions comes from the emotional baggage that underlies the analytical. As humans we follow our friends and those we admire — we want to have the “new” and “greatest” stuff. Nothing wrong with that — unless what’s new doesn’t work optimally for the individual. Don’t get trapped in what other people are doing. Authors Note: I’m a fan of trying new things and learning, so don’t take any of the above as a negative. Everything in context. I’ve run a single front chainring and it’s really nice in many respects. Living in Colorado where most of the riding is either up or down I personally found the single limiting — I missed the low gears while climbing, and was bummed that I couldn’t pedal on the long, fast descents — but that’s me. Each person needs to understand themselves sufficiently to make that choice. OK, I’d Like To Try the Single Front Chainring. Singles are certainly interesting, and there are a lot of vendors now offering them in all sorts of sizes and configurations. From our perspective, the “Wide-Narrow” concept is the best approach for single front rings. Where most chainrings have teeth that are all the same thickness, chainrings dedicated to the job of singles can make every other tooth wide, to match the spacing of the chain — which helps them track better and stay on the ring better (resistance to bouncing off). An example of the Wide-Narrow teeth is shown in the image on the right. 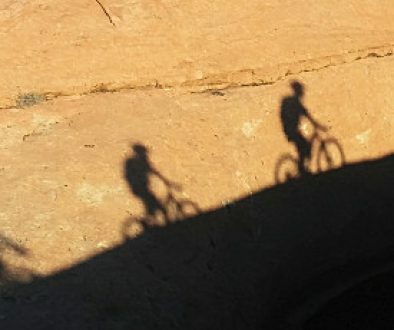 If you go with the single front ring, here’s a good approach: We’ve seen many riders bias the front ring size for their climbing skills and the terrain (smaller front ring for easier or steeper climbing). That gives good ratios for the high-intensity portions of the ride, then, take what’s left for high gears and coast when the trail points down (because there won’t be gears high enough to pedal the fast descents.) For many people this works fine, but in racing (depending on the course), it can be slower. First, terrain. If your riding includes areas that are “more” flat, singles are a great choice. Second, physiological efficiency. If you like to stay at your most efficient conditions (cadence and power), then multiple front chainrings are likely to help you find the optimum in more situations. Third, shifting. If you’re tempted to the single because you hate the crappy shifting of your front rings, you should really try WickWerks BRIDGE Shift Technology. It makes a big difference. Fourth, strength. Running a single in front is not for everyone. See the items above, then evaluate yourself with respect to your strengths. Of course, these are just guidelines. I believe the trend to a single front chainring is more than just a fad, but I also believe the double and triple are not going away. Range and small steps have so many advantages. Plus, with better front shifting now available from WickWerks, the motivation for singles is diminished. Even if you choose to pass on the single, you should at least try one when you get a chance. There is a certain feeling of freedom with the simplicity. Ride on. Comments are welcome. This can be a charged subject, so keep it cool. We won’t publish profanity or inappropriate comments.